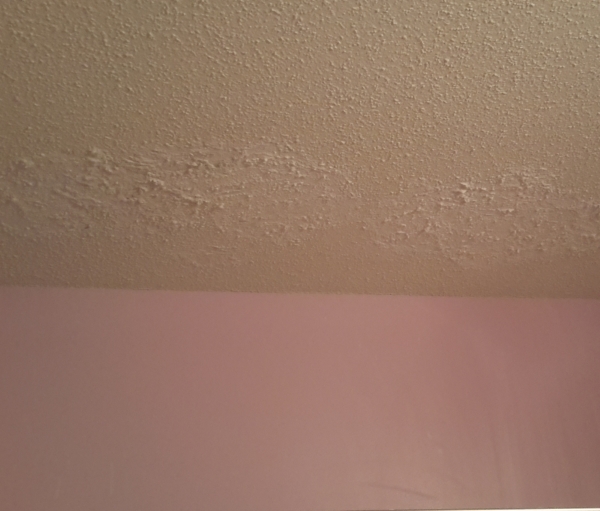 Some day, I hope to have the time and courage to remove the popcorn ceiling from my girls’ bathroom, probably using instructions from View Along the Way. For now, I keep patching it when it starts falling apart above the shower/bathtub. You’ll see textured ceilings in nearly any house you visit. Builders find it easier to slap on a textured ceiling (also known as a popcorn ceiling) than to use standard paint and have to hide their seams. Unfortunately, homeowners find many reasons to hate popcorn ceilings. What Causes Pieces of Popcorn Ceilings to Break Off? 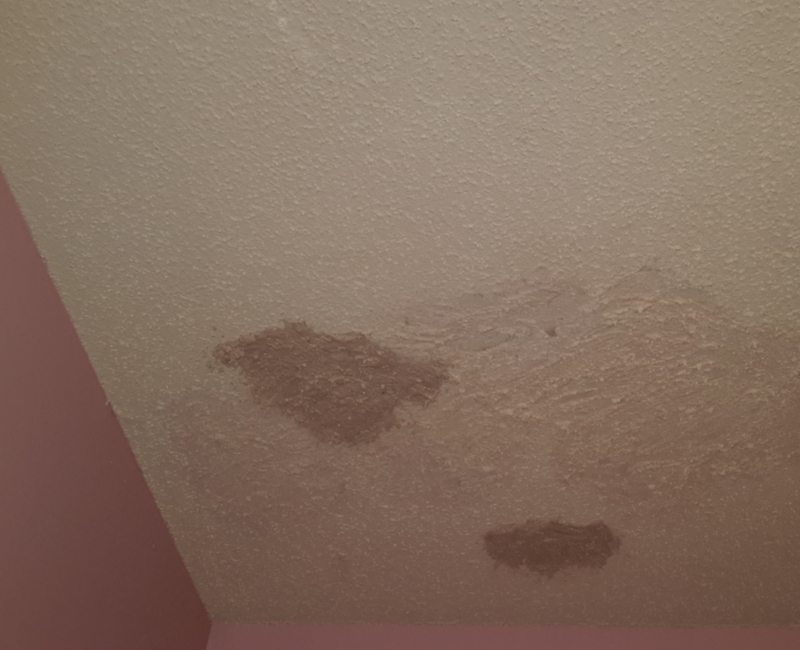 If your roof springs a leak, even a tiny one, or air conditioning condensation causes moisture to accumulate right above the ceiling, you’ll see a big, ugly wet mark on the textured ceiling. The mark won’t go away after it dries, and with a textured ceiling, you can’t just paint over it. Hot, steamy showers can also cause moisture to build up and loosen the textured ceiling. 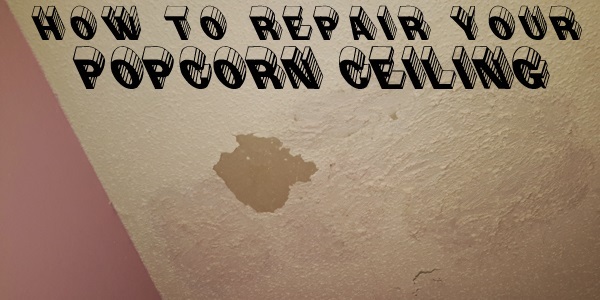 Eventually, chunks of popcorn ceiling may start to break off, leaving unsightly bald spots. My older daughter discovered that she loved long, hot showers years ago, shortly after she started taking showers. Unfortunately, the popcorn ceiling didn’t like all that steam. One day, I heard a shriek from the bathroom. I ran to investigate, thinking a small spider or bug had managed to make its way into the shower. Instead, the sky was falling above the bathtub. 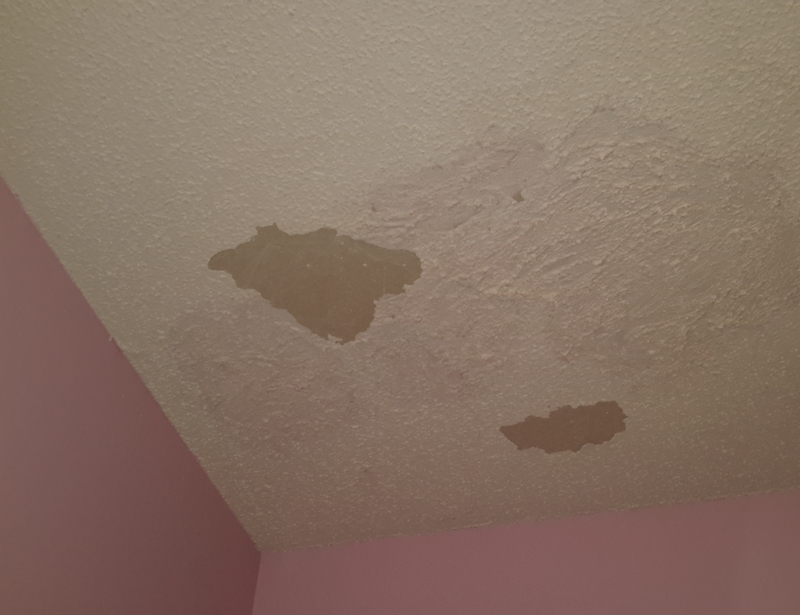 The popcorn ceiling had started crumbling onto my daughter, and once the excitement settled down and the mess was cleaned up, I had to figure out how to fix the big hole in the popcorn ceiling. So How Do You Fix a Popcorn Ceiling Without Losing Your Mind? Before deciding to try repairing the popcorn ceiling on my own, I checked on having a handyman repair it. You might be able to find someone willing to try his hand at patching a popcorn ceiling, but the guys I talked to wouldn’t touch it. Their solution is to get rid of the popcorn ceiling, then paint over it with primer and indoor paint. A friend suggested spray-on popcorn ceiling repair, so I tried some. He warned me that it would be hard to work with, but I couldn’t make it do anything useful at all. Next, I tried a tub of Rust-Oleum 76084 1-Quart Ready-Mix Popcorn Ceiling Patch (cost: about $8), and once I got the hang of it, it did a fair job. Unfortunately, other areas above the tub keep needing repaired in various spots about once a year. Here’s how I do it. First, you’ll need the following: safety glasses , foam paint brushes , a paint stir, newspapers, an old towel or rag, a step stool , a tub of popcorn ceiling patch and a lot of patience. Make sure to wear safety goggles while working. You’ll have stuff falling on you throughout this process. If you hate the idea of getting specks of popcorn ceiling in your hair, you may want to also don a hat or hairnet. 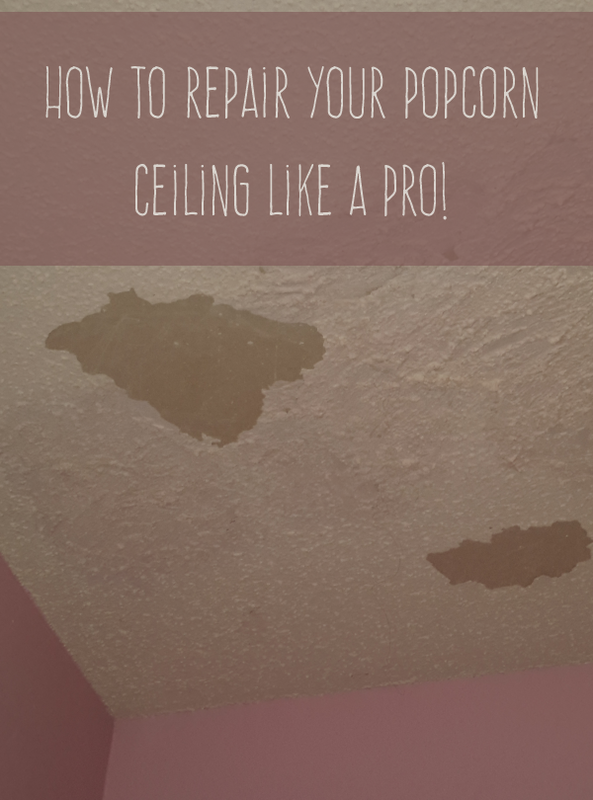 If the popcorn ceiling patch has already been opened and was sitting in a drawer or on a shelf for a few months, you’ll need to rehydrate it before beginning. I add water, starting with 1/8 cup, stirring, then adding a bit more and stirring, until the patch is thin enough to stir but not runny or hard as a rock. You shouldn’t need to add water to a freshly opened tub, though. Begin by removing all of the loose popcorn ceiling. The area needing patched may end up twice as large as what you started with, but if you skip this step, you’ll have a lot of dry chunks falling down while you’re trying to patch the ceiling. Dip a large paint sponge into the patch goop and scoop up a big gob, then carefully apply it to the appropriate area. This is a long, tedious process, since you can only patch a tiny area at a time. It’ll take some practice before you get a feel for how much to put on the sponge and how to properly apply it. Cover the entire area that needs patched, but try not to overlap too much with the good paint. If you get to a point where more is falling down than is staying up, let the patch dry for a few hours and go through the process again. When you’re done, the ceiling still looks terrible. It needs to dry for several hours (preferably overnight or all day). If your paint sponge might still be usable, rinse it out immediately. Cover the patch tub tightly and clean up your mess. After the patch dries, you might need to repeat the process to touch it up. It’s easy to miss spots and very difficult to make a perfect patch on the first try. Once you’ve finished your touch-up work and let it dry, your popcorn ceiling probably still won’t look perfect, but it’s a lot better than having large bare spots. The fact that it’s impossible to make it look perfect probably explains why professional painters and handymen don’t want to mess with patching popcorn ceilings. Hold onto whatever patch you have left, since you’ll likely have to patch again at some point. For ceilings with water stains or other discolorations, you might try something like Zinnser 03688 Ceiling Paint Cover Up . This product has a lot of good reviews on Amazon for covering up stains, but it’s not for a ceiling that’s falling apart. Amazon giveaway: Win a $50 gift card in this super Amazon giveaway!